Let's Start New Year with New Investments in Equities! Greetings of the New Year from Saral Gyan Team! We would like to take this opportunity to thank you for your association with us. 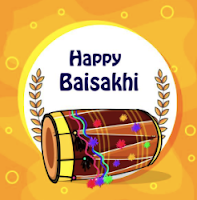 It's that time of the year when we celebrate our traditional new year- Baisakhi in Punjab, Vishu in Kerala, Bihu in Assam, Noboborsho in Bengal. Let's consider these auspicious times to initiate a long term wealth creation journey. Post significant correction in broader markets over last 15 months with most of the small & mid cap companies stocks are still available at discount of 40% to 60% from their peak prices of Jan 2018, Saral Gyan team encourages you to invest in well-established small & mid size companies that have stable business with strong financials, robust growth outlook, vast experience and prudent management. Through Hidden Gems and Value Picks, we're providing you opportunities to invest in such small / mid caps stocks today. Start investing some portion of your monthly income in good companies without timing the stock market and you will definitely get rewarded in long run. In fact, post severe correction witnessed in small and mid caps since Jan 2018, we are confident that small & mid cap companies backed by good fundamentals will deliver far superior returns compared to large cap stocks in coming years. Even after severe correction in small cap stocks during last 15 months, 41 Hidden Gems stocks out of 76 during last 8 years are giving 100% returns to our members. Moreover, 33 stocks out of these 41 are giving returns in the range of 150% to 1800%. In fact, we advised to book partial or full profits / exits in many of these stocks at higher levels during last couple of years. We are confident that we will continue to hunt best Hidden Gems and Value Picks from universe of small & mid caps by doing authentic, in-depth and unbiased research work and support our members to make educated investment decision. Time has shown that smart investors have made their fortune by investing in equities in long term. None other asset class can match giving you such extra ordinary returns. Yes, its important for you to invest in right set of companies at right price with medium to long term perspective. If you think to invest in stocks for period of 6 months or 12 months, we suggest you to stay out of stock market because you are not investing, you are betting on volatility of stock market which could be risky. Under our Wealth-Builder service, we encourage our members to replicate our Wealth-Builder portfolio by investing in selective high quality small and mid cap companies. These companies are reporting 20-30% + annualized growth and got their due share of re-rating and delivered exceptional returns to our members so far. Since 1st Jan 2013, Nifty has given returns of 95.3%, Sensex returns is 97.5% where as Wealth-Builder portfolio has given returns of 258.8% returns to our members. 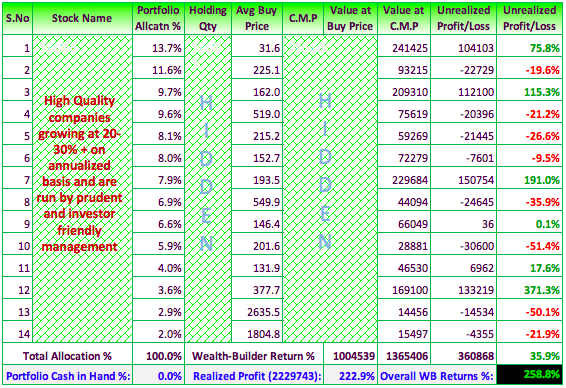 In case you have not yet started building a portfolio of high quality and fundamentally strong growth stocks for long term wealth creation, please find below the Wealth-Builder portfolio allocation & performance update for your reference. Now you can add power to your equity portfolio by investing your long term savings into best of small & mid cap stocks with our services Hidden Gems, Value Picks and Wealth-Builder. Avail attractive discounts by subscribing to our combo packs. Below are the details of our annual subscription charges, simply click on SUBSCRIBE! link to subscribe to our services online using debit / credit card or net banking facility. We also take this as an opportunity to inform our readers that our Combo - 1 (Annual subscription of Hidden Gems, Value Picks, 15% @ 90 Days & Wealth-Builder) is the best selling subscription service at Saral Gyan, we have registered maximum subscription of Combo 1 since beginning of this year followed by Combo 2 subscription. We keep on updating our members on our past recommendations suggesting them whether to hold / buy or sell stocks on the basis of company's performance and future outlook. 4. Wealth-Builder (An Offline Portfolio Management Service): Wealth-Builder is our model portfolio of Rs. 10 lakhs and currently we are holding 16 stocks in our portfolio. We suggest higher allocation in our Wealth-Builder stocks which includes best of our Hidden Gems and Value Picks released during last couple of years. Our team suggest all our Wealth-Builder members to invest in the stocks which are part of our Wealth-Builder portfolio. Every month our team updates our Wealth-Builder members which stocks they need to buy / sell / hold with % allocation of these stocks in their portfolio, the suggested changes need to be replicated in the same proportion. Annual subscription charge of Wealth-Builder is INR 20,000 under which you will receive total 12-18 portfolio updates. We also review existing equity portfolio of our members and advise them which stocks to hold and which to exit based of fundamental analysis. Moreover, we do look at sector wise / stock wise allocation in the portfolio and advise in case of any corrective measure needs to be taken by increasing or decreasing the stock specific allocation. Our Wealth-Builder service is suitable for those investors who have an existing portfolio of at least 2 to 3 lakhs or planning to invest similar amount or more in equity market. Click here to read more about Wealth-Builder. Also Read: Grab Techno-Funda Stock Pick Report for Free!